I’ve selected some of my most popular designs and made them free patterns for you to download*. Some will be here for a while, others will make “guest appearances”. You are very welcome to print the pattern and make the project for yourself, for family and friends and for charity projects (*please see below for other uses). If you enjoy the pattern, please feel free to share on Pinterest/Instagram/Facebook etc. and do post pics of your finished projects, links to your own blogs etc. here in the comments or on the Facebook page. A link back to my site for the download would be much appreciated. 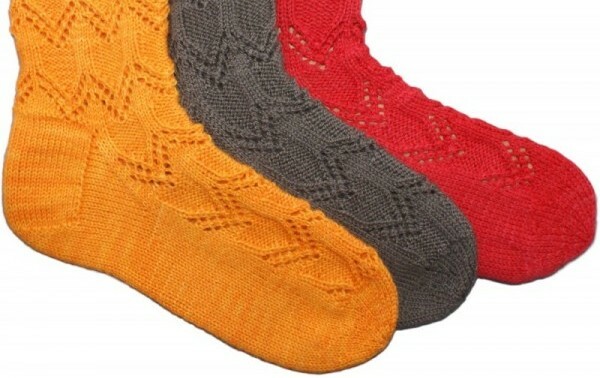 An easy sock pattern, ideal for your first-time socks or for a quick gift. Knits using 100g of any standard DK sock yarn or choose one of our undyed yarns and dye up a skein of yarn for a look that is unique to you! *As these are projects I use on my own workshops, please respect my work and contact me if you would like to use the patterns for anything other than personal or charitable purposes. Please do not use them for teaching your own workshops, print, photocopy or link to the patterns for sale without permission. I’m open to approaches to use my work (and I promise I don’t bite! ).